This is a special order item. Please allow 2-3 weeks production time. Our ultimate Renaissance Wedding Gown! The wedding edition of our popular Eleanora of Toledo Gown includes the detachable cape! Forty buttons accent the sleeves, dozens of yards of trims, and fine stitches. 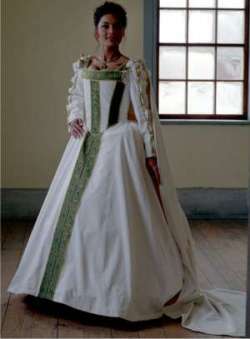 This is a reproduction of the gown worn by Elenora of Toledo when she was laid to rest. Elenora, wife of the Grand Duke Cosimo I, held a noble station in society which she showed in her clothes. The chemise puffs through the slashes in the sleeves, the bust line is flattened and lifted by the corset, the bumroll and farthingale make the skirts lay larger to give the illusion of a smaller waist without the body alterations practised by the Victorians. Made of cotton velveteen and lined in various satin and trim colors. Dry clean. Please note that we do not accept any returns or exchanges on wedding gowns. All sales are final at the time of purchase. Please order carefully. If in doubt of your size, please contact us and provide us with your actual measurements. We will send you the dress which will best fit or can be altered down by a seamstress in your area to acheive a good fit. Waist 22-25 7/8" 26-29 7/8" 30-34" 35-39"
Bust up to 36" up to 38" up to 39" up to 43"
Hips up to 38" up to 40" up to 46" up to 48"